ATTENTION FANS: AFANA WANTS YOUR HELP! ¡AFICIONADOS ATENCIÓN: AFANA QUIERE SU AYUDA! 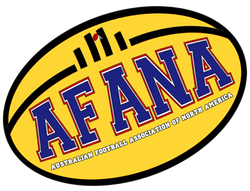 The Australian Football Association of North America (AFANA) needs match journalists in the USA, Canada, Melbourne, Brisbane, Sydney, and Adelaide, as well as other locations which host AFL matches such as Canberra and Launceston. You must write well but you do not need to have prior sports reporting experience. The job is volunteer but you get real experience as a journalist alongside the professionals. Your work will be professionally edited and if you do well, we will provide professional references. We are also looking for assistant editors, broadcasters, writers, and social media staff for podcasts, newsletters, and social media such as Facebook, Twitter and other new platforms. We also need general news website reporters based in the USA, Canada, and Mexico. We are in particular need for a bilingual (Spanish/English) staff member to assist in our growing Mexican and Latin American coverage. Estamos en particular, la necesidad de un bilingüe (Español / Inglés) miembro del personal para ayudar a nuestra creciente cobertura mexicana y latinoamericana. We can always use volunteers to help in other ways, too, as we can always use help in all aspects of our operations.